The process of dehydration consists of extracting part of the water content of the forage, reducing it to the percentage necessary to keep it in perfect conditions for long periods of time, with qualitative properties similar from those of the fresh product. Dehydrated alfalfa has many advantages compared to sun dried alfalfa. It is obtained a more homogeneous product. There is no loss of the nutritional value of the forage. The degree of microbial contamination is controlled and there is an important economic saving in terms of transport because the dehydrated alfalfa has a lower percentage of water. In Inamosa there is a person supervising the crop. He is in charge of deciding the moment of cutting, swathing and the optimal collection of the product for a better quality of the forage. Our technical engineer also advises us to apply the appropriate phytosanitary products, with the correct doses and safety periods and the correct fertilization. 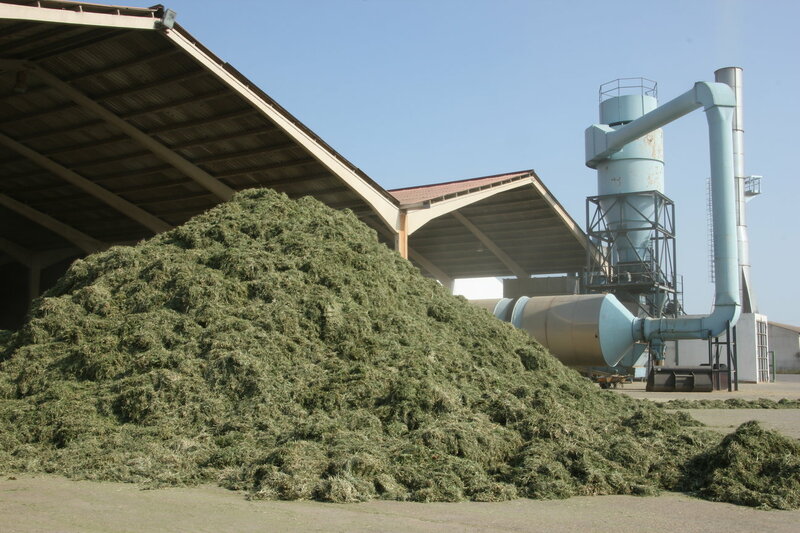 We have a wide raw material reception area, where we unload the alfalfa separately from suppliers and batches. This is where we do the first quality control, examining the organoleptic conditions of the raw material, colour, appearance, smell, absence of pests and the presence of weeds, for their subsequent batch classification. The factory consists of two production lines of forage, one for the production of dehydrated bales and another one for the production of pellets. It should be noted a large closed storage capacity, which allows us to store the product during the harvest period and guarantee our customers a continuous supply throughout the year. Having a good storage infrastructure also allows us to store the product by quality and batches duly differentiated, in order to guarantee the traceability of our products. Reception of the raw material in the designated area for this purpose where the first quality control is carried out. Afterwards, the alfalfa goes through the trommel where it is dehydrated. Normally the alfalfa will remain between 5 and 10 minutes in the trommel, reaching at least a temperature of 250ºC. The trommel has some cleansers of stones at the exit where the possible stones and heavy materials that are in the drying process fall down. When the product comes out of the trommel, it goes through the cooler, which lowers the temperature of the alfalfa to the desired levels. Cooling is carried out by air currents induced by a cold group. Once the product leaves the cooler it can go to the granulation zone, where the pellet or granule is made; or to the press. The press is the machine where the dehydrated product is compacted forming the bales, which are tied with cord. Before the alfalfa goes through the press, we perform an infrared protein and moisture control (NIR) and a second microwave moisture control in the same press machine. Subsequently, the end product is stored in closed warehouses and is perfectly identified by batches, which guarantees the traceability of the product at all times. The main use of dehydrated alfalfa is for feeding animals, mainly species for milk production. 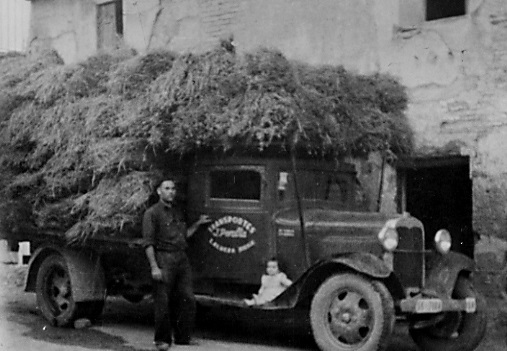 After the dehydration process, the forage is pressed until it takes the form of large compact bales that can weigh from 700 to 800 kg. The tied is with cord. The forage, once dehydrated, is ground and granulated, obtaining our very compact pellets. Our pellet is 5 mm of diameter. Normally we produce pellets with a protein content of 16 – 17%, although we can also produce other qualities on request. Our pellet is 100% natural and is suitable for all kinds of animals including rabbits and pets.